When water is heated, it expands, increasing the pressure in closed heating systems. Over time, these pressure fluctuations can damage the system's components. An expansion tank is designed to alleviate this pressure and extend the life of your system. Here's how it works. Homeowners looking to maximize the efficiency and life expectancy of their heating and cooling systems may want to consider installing an expansion tank as an easy and inexpensive means of regulating water pressure and preventing costly damage to other components, including pipes. An expansion tank is designed to relieve pressure in both potable water and closed hydronic heating systems. It ensures that constant pressure is maintained within the pipes so they do not get damaged from excess pressure. “An expansion tank in a heating system is an invaluable component that protects the entire system from the increased pressure and volume caused by heating,” asserts Daniel O’Brian, a technical expert from online retailer SupplyHouse.com. Expansion tanks work by equalizing pressure throughout the system. An expansion tank is a small tank divided in two sections by a rubber diaphragm. One side is connected to the pipes of the heating system and contains water. The other side is dry and contains pressurized air, set at approximately 12 psi. 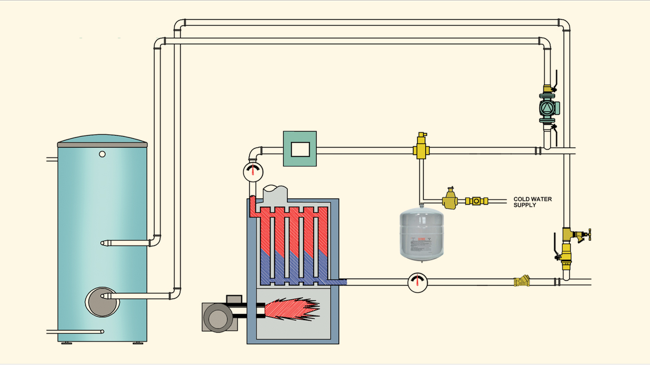 As hot water enters the heating system, the pressure in the system increases. As pressure increases, the diaphragm in the expansion tank is pushed down. This compresses the air in the tank, creating more space for excess water to enter. This relieves excess pressure in the system and prevents pipes in the system from being damaged. Installing an expansion tank is a relatively simple process that can typically be completed in less than an hour by a handy do-it-yourselfer. Some local building codes may require installation by a licensed plumber, however, so you should check with your municipal building department before proceeding with any installation. Expansion tanks vary in capacity, ranging from tanks that hold as little as two gallons to large tanks that hold several hundred gallons. To determine the size needed for your system, online retailer SupplyHouse.com offers a handy Expansion Tank Sizing Calculator on its Web site. Use it to determine the size and model of the expansion tank that’s best suited for your system. Prices for expansion tanks start at about $30 for small residential tanks and climb up to $800 to $1,000 for larger, commercial tanks. 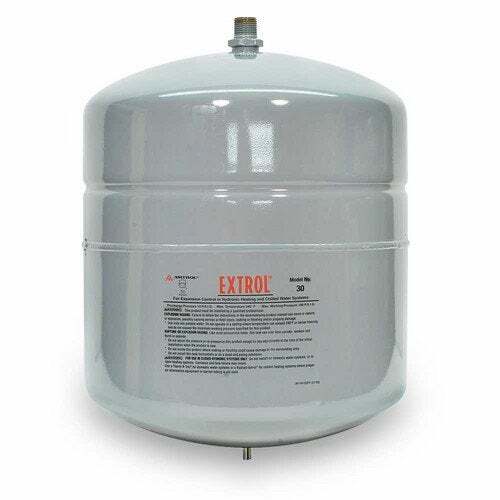 Leading brands include Extrol expansion tanks, manufactured by Amtrol, which are used for hydronic heating systems; the Watts ET series and Bell & Gossett HFT expansion tanks, both designed for use with closed hydronic heating systems; and Therm-X-trol expansion tanks, for use with potable water open systems. If your home already has an expansion tank in place, you may want to check it periodically to make sure that the tank is functioning. To check if the expansion tank is working properly, simply place your hand on the tank and feel its temperature. The top portion of the tank should feel warm to the touch, and the bottom portion of the tank should be room temperature. If the entire tank is warm, it is likely that the tank has completely filled with hot water, which occurs only if the diaphragm fails. If this happens, the tank must be replaced immediately. Online retailer SupplyHouse.com offers a large selection of expansion tanks and accessories from the top manufacturers in the industry. To learn more, watch the video below or visit SupplyHouse.com.